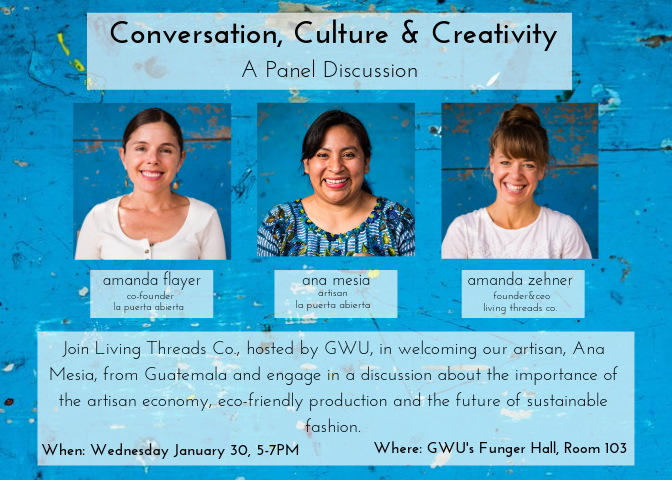 Join Living Threads Co., hosted by The George Washington University, as we engage in a panel discussion about the importance of the global artisan economy, the preservation of traditional artisan crafts, and the value of sustainable production. AMANDA ZEHNER | Founder of Living Threads Co.
Amanda taught bilingual elementary education in Oakland, California. She graduated from UC Berkeley with a focus in education and Spanish. Amanda arrived in Guatemala in 2003 as a Peace Corps volunteer. While she never imagined that she would be planting her roots in rural Guatemala, she couldn’t be happier living in a colorful rural village with her husband, two rambunctious daughters and equally rambunctious dogs. Amanda is Founder and Co-Director of La Puerta Abierta, a local center dedicated to early childhood education and primary school, where she spear headed the formation of the Mother’s Artisan Group, a partner of Living Thread Co. She also coordinates all staff and programs in Guatemala for The Sparks Foundation. Amanda feels fortunate to have work that is creative, meaningful, and keeps her connected to the playful spirit of children. 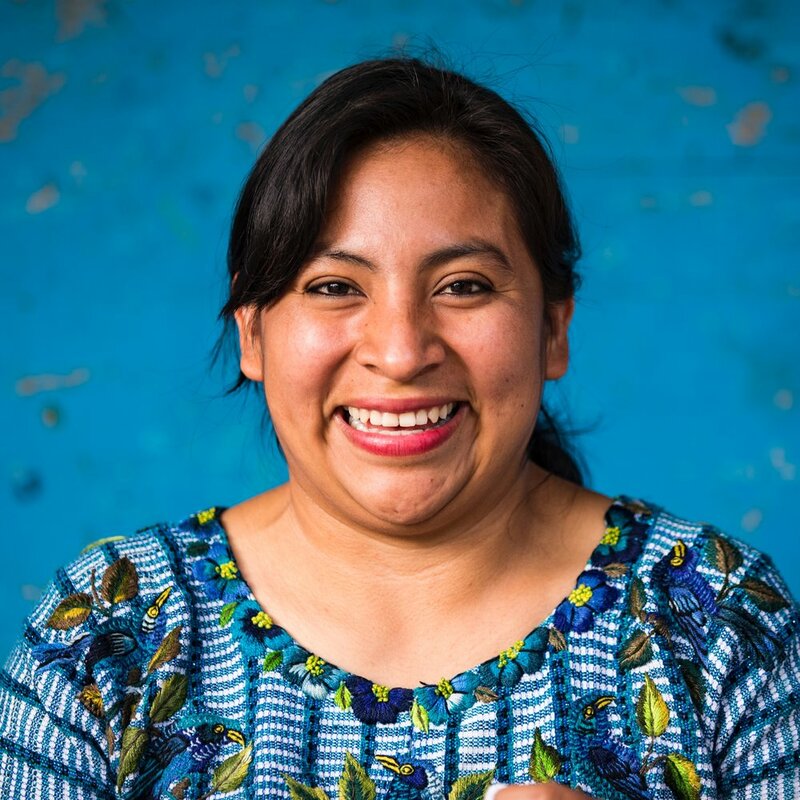 Ana Mesia from Santiago Atitlan, Guatemala is a Living Threads Co. partner artisan through the Puerta Abierta Learning Center. Ana is a teacher, a mother of two young children, and currently enrolled in university courses at the Universidad Panamericana de Guatemala. Ana self identifies as indigenous Maya and learned to embroider and weave on a traditional backstrap loom as a young child. Today Ana is an expert in her hand craft of embroidery, passionate about education, and a valued partner, educator and artist. Come by Solace Brewery for last minute shopping! Sip on Solace's new Double Dope DIPA or an old favorite like the Barrel Aged Manhunt stout while shopping our artisanal on-of-a-kind handwoven gifts from scarves, to pillows and throws. Give a gift this holiday season that has a story of impact and makes a real difference on the lives of our partner artisans around the globe. Come out and support small local DC business while getting your Holiday gift shopping done! Unique hand woven textiles with a soul and a story. Excited to be back in the Market just in time for the holidays! Featuring our limited edition home textiles from pillows to throws and table linens - we will have the perfect unique, artisanal gift with a social impact for the holidays. The DACHA Annual Holiday Market is back! Join us Tuesday, December 12th with other great local brands and DC creatives for your holiday shopping! Come by the new Takoma Park Yoga Heights studio to shop unique goods while you support small DC business and creatives! Living Threads Co. is excited to be a featured brand in the DC based pop-up Brief Assembly - a curated selection of innovative, unique, and stylish products from brands organizers Mallory and Carolyn respect and admire. Don't miss Living Threads Co. and our artisanal home textiles and scarves at Dacha Beer Garden's Oktoberfest Market, this Thursday 4 - 10pm. Market will include over 16 local D.C. vendors, Wiehenstephaner's Oktoberfest beer and a raffle for custom Dacha Oktoberfest swag! See you there! Join us for an interactive and fun workshop with artist and weaver Hannah Elmer! Pop-Up in Yoga Heights D.C. Located in D.C. but want to visit Living Threads? We'll be popping up at Yoga Heights studio in D.C. Saturday and Sunday featuring some of our handcrafted yoga blankets and towels. Invent your own Scent! We invite Andi of Bathologie sharing her bath, body and home products from plant-based ingredients that nurture you and your skin. Support local and shop #EthicalBlackFriday #SmallBusinessSaturday and #CyberMonday sales all weekend! "Demand quality, not just in the products you buy, but in the life of the person who made it." Join us at our storefront in Reston Town Center to hear a moving talk by Healing Through Art member and celebrated Nigerian musician, Tunde Odunlade. We're excited to invite Amanda Deaton of Noonday Collection to pop-up in our Reston, VA store! Join us outside our storefront in Reston Town Center for this fun Work Perks event!